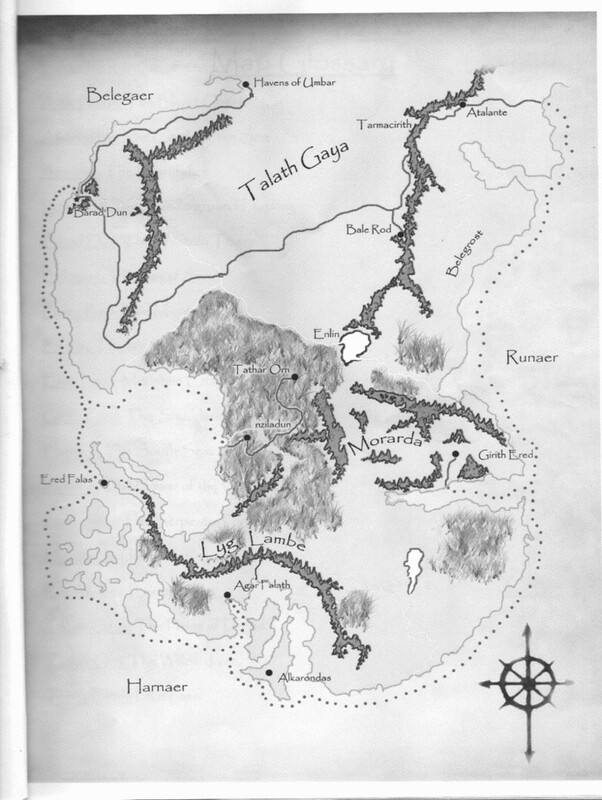 Ok, I was going to scan this because of the beautiful caligraphy and map of the Realm, but since there are tons of stuff piled on top of my scanner and I am feeling lazy, I will type out the codex and scan the map later. If I screw anything up in the retelling here, then Surt and Kurn will just have to come back to vegas and beat me with foam weapons. Here goes. All members will treat all other members with honor and respect. All members will conduct themselves in a manner that brings honor and good reputation upon the Kingdom of Barad'dun. Soldiers must never suffer dishonor, from themselves or their peers. Soldiers are required to wear and present the rank sash, and to carry the royal dagger while representing the Kingdom of Barad'Dun. I, __________________ do solemnly swear service to the Adunakhar adn the Kingdom of Barad'Dun. I swear to uphold the ideals set forth in the Royal Codex, in times of war and peace. I swear to obey the decrees of the Adunakhar, and the officers set over me and to aid them and my brethern in any and all causes. I swear to stand with them, to fight side by side with them, and die with them if neccessary to protect and honor our Kingdom of Barad'dun. I swear, to my utmost abilities, to serve the Kindgom, to defend and protect her from enemies within and beyond, and to see that her glory lives on forever whatever the cost to my life or property. This I vow, here before my Adunakhar, the Royal Army and ___________(deity of choice) that as a soldier of Barad'Dun I shall never break this Oath on pain of being forever swallowed by everlasting darkness. III. RANK STRUCTURE OF THE ROYAL ARMY. Adunakhar: Leader of Barad'Dun, head of the Tribunal, Commander of the Royal Army. Shepherd: Second to the Adunakhar, Member of the Tribunal, keeper of the Litany, Commander of the Royal Army. Marshal: Third to the Adunakhar, Member of the Tribunal, Head Herald, Weapon's Master. Adunabar: Fourth and highest Enlisted Rank. Senior Adunabar acts as tie breaker to the Tribunal, Keeper of the Mandate. Sentinel: Third Enlisted Rank, keeper of the mandate. Narbu: Second Enlisted Rank, keeper of the Mandate. Corsair: First Enlisted Rank, keeper of the mandate. Initiate: One who wishes to join the Royal Army. Mercenaries: Members of the Realm who do not join the Royal Army. Persons holding hte same rank will be structured according to their senority in the Realm. Oldest (by rank) active member to youngest. IV. SASHES AND RANK INSIGNIA. (I will have to scan the sash's in on a separte .jpg or .gif) The mercenary sash is black with a red six pointed star. The ranks sashes are khaki or brown (?) with appropriate symbols. One who wishes to join the Royal Army must own and maintain at least one set of Minimal Garb. One must seek out and win the favor of a benefactor of Sentinel rank or higher to be considered for enlistment. One should have a small outline or basic idea of the character they wish to portray. While one is an initiate, any misdeeds will also be born by one's benefactor. It si the duty of the benefactor to train the Initiate. While an Initiate, one's benefactor may strip one of their rank with just cause. Upon acceptance as an Initiate, one will be awarded an Initiate sash. To attain this rank, one must successfully complete the first circle of Loyalty, Dedication, Time and Strength. To attain this rank one must have an outline and bigoraphy of the character they wish to portray. Upon attaining this rank one's name will be recorded in the Litany of Barad'Dun. To attain this rank one must give the oath of service. Upon attaining this rank all official ties with one's benefactor are severed. The Corsair now answers alone to any misdeeds. Upon attaining this rank the Corsair will be awarded with a corsair sash and a royal dagger. To attain this rank one must successfully complete the second circle of Loyalty, Dedication, Time and Strength. Upon attaining the rank of Narbu, it is the duty of the Narbu to be watchful of the ranks below them, and to report any deeds of good or bad, to the tribunal. Upon attaining this rank the Narbu will be awarded a Narbu rank sash. To attain this rank one must successfully complete the third circle of Loyalty, Dedication, Time and Strength. Upon attaining the rank of Sentinel, it is the duty of the Sentinel to be watchful of the ranks below them and to report any deeds, good and bad, to the Tribunal. Sentinel's may also now be benefactor's to anyone wishing to be an initiate. To attainthis rank one must successfully complete the Fourth circle of Loyalty, Dedication, Time and Strength. To attain this rank one must have earned the following commendations: Legend, Journeyman in foamsmithing, and two other Craftsmen categories. Upon attaining the rank of Adunabar, it is the duty of the Adunabar to be watchful of the ranks below them and to report any deeds, good and bad, to the Tribunal. The Senior Adunabar will act as a tie breaker to the Tribunal. Upon attaining the rank of Adunabar one will be awarded an Adunabar rank sash. BASIC WEAPON: Any weapon of simple design. BENEFACTOR: One of Sentinel rank or higher who reccomends an initiate. and bracers) Flail weapons are now allowed. FOURTH: All the above plus, one set of good garb (four total) and one dress uniform. FIRST: Dagger only fight, best 2 of 3 versus an opponant of Corsair rank or higher. strikes versus opponant one rank above them. FOURTH: Same as Second, but the Tribunal will choose the Opponant. FIRST: 6 months of active membership. SECOND, THIRD, & FOURTH: 3 months each, of active membership in good standing. GOOD GARB: One step above minimum garb. both good and bad, etc. 'preferred kit' would ge that with which he is known to fight with the most. will be duly noted in the Litany. worn with a covering of some sort. OATH OF SERVICE: The oath taken by those of hte Corsair Rank. belt and must be clean and presentable at all times. The Glossary to Said Map of the Realm of Barad'Dun. And the Rank Sashes of the Royal Army. Kurn will be sending me color pic's of the Realm, plus individual regions within the realm including the city of Barad'Dun itself. When they arrive I will post them as well. Also Alacian has been working on a Website and new forum that has been approved by both Kurn and Surt so should be up and running soon as it is finalized. 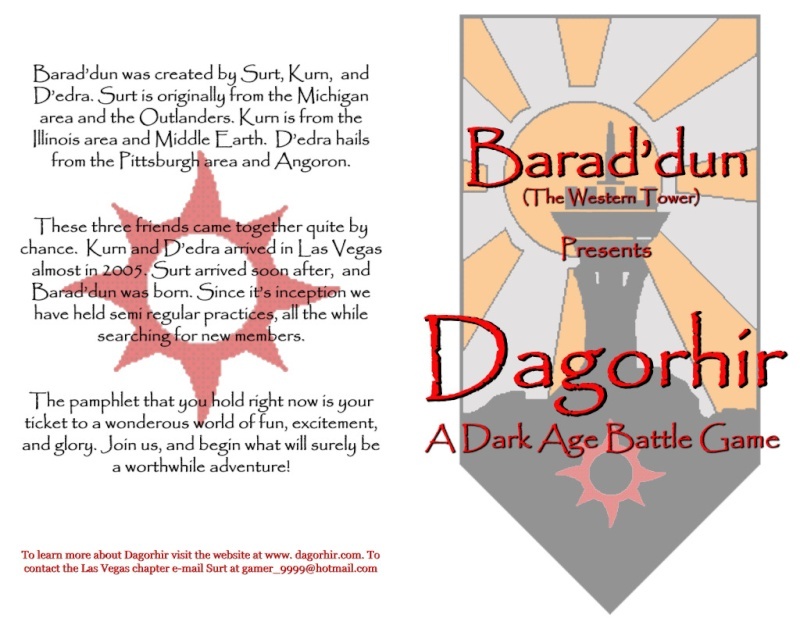 Kurn's pamphlet showing the Barad'Dun banner on the right. I also have a 'midnight' or 'moonlight' version of the banner. Subject: Re: Royal Codex of Barad'dun.